Cecil's choice of ten stories about toys that come alive is presented in an invitingly large format with glowing illustrations. 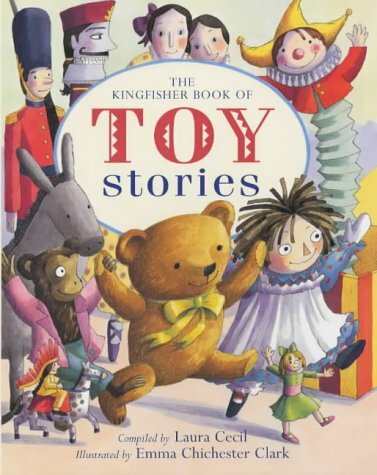 It's a collection of well-tried tales, including retellings of 'The Nutcracker' and 'The Steadfast Tin Soldier'. All are suitable for reading aloud to young children, who will be enchanted by the illustrations. These have almost as much space as the text, ranging from full-page plates and half-page double spreads to borders and cameos. As ever, they are vibrant and full of character. Chichester Clark is as much at home in the sunlit garden, in which the little wooden dolls, Purl and Plain, go adventuring, as in the moonlit nurseries that are the more usual venues for toy shenanigans. She has the knack of conveying movement in the 'living' toys that is somewhere between mechanical and organic, and her gentleness and humour soften the more disturbing elements in storytellers like Andersen and Hoffman, without losing any of the excitement.